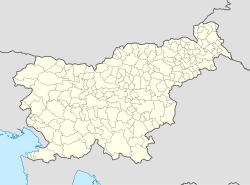 Radomlje (pronounced [ˈɾaːdɔmljɛ]; German: Radomle) is a settlement on the left bank of the Kamnik Bistrica River north of Domžale in the Upper Carniola region of Slovenia. The local church is dedicated to Saint Margaret (Slovene: sveta Marjeta) and was first mentioned in documents dating to 1391. ^ "Population by settlements, detailed data, Slovenia, 1 January 2016". Statistical Office of the Republic of Slovenia. Retrieved 29 December 2016. This article about the Municipality of Domžale in Slovenia is a stub. You can help Wikipedia by expanding it. This page was last edited on 20 August 2018, at 06:37 (UTC).